A bank robbery is shown that involves the use of poison pins attached to coins that cause a clerk to collapse while the robbers hold the customers at bay with guns. They threaten the survivors, telling them that an object they are leaving behind is a bomb they can detonate with “wireless wave” if anyone moves. The clerk now calls in famous detective Hawkshaw, who bears a passing resemblance to Sherlock Holmes, though he seems to favor a cigar rather than a pipe. Hawkshaw swings into action by going out to the theater, but his dog Spot is able to use scent and track the robbers to their home, which he infiltrates by pretending to be hit by a car outside the door, and the woman with the robbers brings him in and cuddles him and gives him a saucer of water or milk to drink. As soon as he’s been left alone in the room, he starts to gather incriminating evidence from the wastebasket and the desktop, and finds a set of keys. He somehow gets out of the house without being let out by a person and runs back to Hawkshaw. Hawkshaw uses the address on a torn envelope Spot has brought him to track the robbers to their lair, although it’s not clear how he knows that they are guilty of anything. He uses the keys to get in, and sneaks up behind a robber, quickly disarming him, but he is overwhelmed when more robbers come into the room. However, during the struggle, he holds down a robber with one hand and writes a note to the police with the other! So, Spot quickly runs off to the police station, where several officers dressed like Keystone Kops read the note that Hawkshaw has written informing them to raid the place. They swoop in and pick up the robbers and recover the money. Once again, inspector Hawkshaw has saved the day! Hopefully, Spot gets a doggy treat, at least. Hold still while I write! I wasn’t too impressed with this movie, overall, and in terms of “animal movies,” I would put it far behind “A Little Hero” in entertainment value. For one thing, the human actors are clearly inferior to Mabel Normand, which partly explains why their names have been lost to history. The dog is cute enough, but not really as impressive in his performance as the dog in that movie, let alone the awesome cat actor. The best “acting” he does is his pretense of injury, which he drags out for quite a while, but the humans have to be awful dumb not to notice that he lacks any bruises or breaks, especially when they pick him up and bring him inside. Also – what did Hawkshaw expect to accomplish by going to confront the robbers alone? Why did he write a note to the police while in physical conflict, but not bring them along in the first place? And why did he go to the theater when he was supposed to be investigating a serious crime? 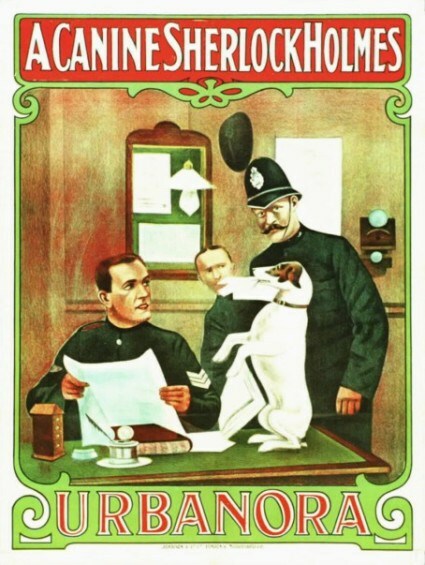 Obviously, a man who would go nowhere without canine support. But, the criminals don’t make much more sense: what possible advantage is there to knocking out a clerk with a complicated poisoned coin when you’re going to hold everyone up with guns in the first place? It’s a typically Feuillade-ian piece of surreal logic. I have not found this for free on the Internet. 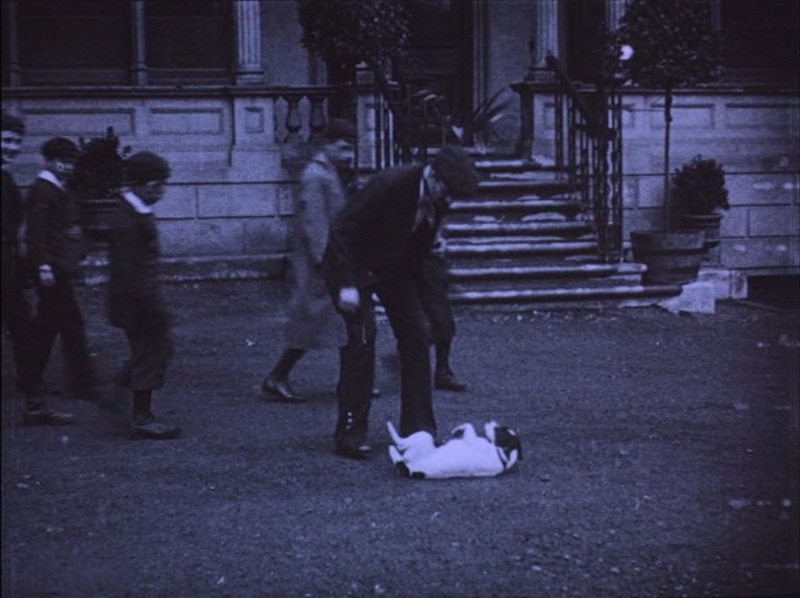 It is included on the Flicker Alley release of Sherlock Holmes (1916) on DVD. If you find it available for free, please comment. I saw the film in a programme of Holmes films at Le Giornate del Cinema Muto. I think most of the audience were more impressed with the film than you were. When Spot pulled his ‘injury stunt’ there were waves of laughter round the Verdi. The humans are rather inadequate, but then that puts the focus correctly on Spot. Hi Keith, thanks for your comment! 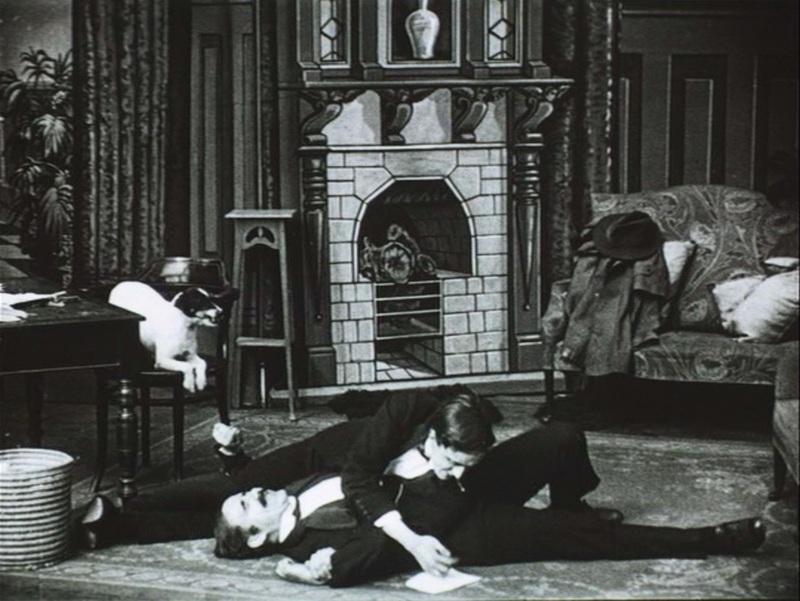 It probably goes to confirm what I’ve said before: silent comedy plays better with an audience.